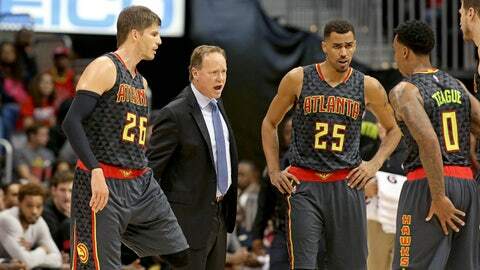 ATLANTA — Following offseason surgery rehabs for two of the Atlanta Hawks’ most prominent wing players, Kyle Korver and Thabo Sefolosha have been eased back in to the team’s rotation in the early stages of the season. Both players saw time in the season-opening loss to Detroit, but Sefolosha did experience some tightness in his ankle after the game. In the season’s first back-to-back against the Knicks and Hornets, however, coach Mike Budenholzer gave Sefolosha the night off on Thursday in New York, and he followed that up by resting Korver Friday night against Charlotte. Once it was announced that Korver would be sitting against the Hornets, Budenholzer was asked about the situation of resting the recovering Hawks (2-1) in back-to-backs. "Over the course of the next two or three weeks, we’ve got quite a few games in a short period of time," Budenholzer said. "I think we’ll kind of evaluate each game, each situation as it comes, but I could see where this won’t be the first or the only time that we do it here at the beginning of the season." Any time Korver or Sefalosha are removed from the rotation for a game, the Hawks will miss their presence in two completely different ways. Korver is the backbone of an Atlanta offense that relies on spreading the court, as he demands non-stop attention no matter where he is on the floor. Last season, Korver led the Hawks and was sixth in the NBA with an plus-8.3 plus-minus per game. To no surprise, Korver led the Hawks through the first two games this season with a plus-13 plus-minus headlined by a dominant performance Thursday against the Knicks. Korver’s absence was evident at the end of the playoffs, and Friday’s matchup proved to be no different as the Hawks had their worst shooting night of the young season (43.4 percent) against the Hornets. On the other hand, Sefolosha’s absence influences the team on the other side of the floor. In his return to the Hawks in the season opener, Sefolosha totaled six defensive rebounds and four steals in just under 19 minutes on the floor. With Sefolosha on the court, the Hawks instantly become a better rebounding and defensive team. In the 2014-15 season, Sefolosha led the team and was 24th in the NBA with a 2.97 defensive real plus-minus per game. Sefolosha’s impact on the defensive end to the Hawks last year was highlighted in this preseason piece about his return, and his presence has already been felt during his time on the floor this season. "When he’s played, his activity and the length and the deflections and the steals, and just all the little plays, he’s been a real positive for us in just two games so far," Budenholzer said. "It’s great to see him play like that." To combine with Sefolosha’s four points, six rebounds, three assists and two steals against the Hornets, he was optimistic afterwards about how he felt and about the team following the 97-94 win. "I feel good," said Sefolosha. "I’m trying to give everything I’ve got to the team … to open the season, try to establish the mindset that we need to carry on the whole the season, so it’s a good start for us." When Sefolosha or Korver are out for a game, the task will likely fall on Kent Bazemore on most nights to pick up extra minutes. Already starting in place of DeMarre Carroll’s spot last season, Bazemore will be depended upon to play lockdown perimeter defense and improve on his perimeter shot to help the Hawks’ offense spread the court. With Sefolosha out against the Knicks, Bazemore embraced his defensive side and held Carmelo Anthony in check when given the assignment. With Korver out against the Hornets, Bazemore embraced his perimeter shooting side and knocked down four of his five three-point attempts on his way to a team-high 19 points. Bazemore suggested he might have had a little help for the game: "I borrowed Kyle’s jumper just for tonight."